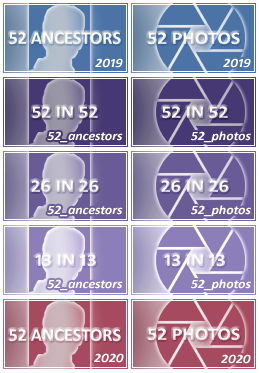 Ready for Week 12 of the 52 Ancestors challenge? No, it isn't a typo. The theme for Week 12 really is "12." If you look at a numbered ancestor chart and you're at the beginning of it, #12 is your mother's father's father. You could also write about someone with a birthday or anniversary in December or on the 12th of any month. Be creative! P.S. You can see your numbered ancestor list by clicking the Ancestor List link on your family tree and tools page. #12 Oscar Newton Showalter is my mother's father's father. He was born in Kansas in 1885 and migrated with his family to Sebastopol in Sonoma County, California in 1893 when he was just a boy. He died young at the age of 42 after being thrown from a horse at Mann's Ranch on the coast. So young for your great-grandfather to die. So tragic that his mother died young, he lost a young child, then died young himself. #12. [ [Ledford-1052 | Charlie Ledford ] ] is my mother's father's father. Not much is known about him, and what is, is vague or unflattering. The story was that work was very difficult to find and sustain in the early 1900s in the land-locked far reaches of the North Carolina mountains. For that reason, Charlie had to travel to find work and wasn't often home. His wife and four children fended for themselves, particularly after his early death. I can't say that I ever heard a positive story about him, which created a line of really strong women, and a powerful work ethic. That was a rough life for your mother's Grandmother and her children. So sorry for what they must have gone through. Life was hard then for so many. We have no idea, do we? My great grandmother Phoebe Palestine Morris Long. https://www.wikitree.com/wiki/Morris-15783 had 12 pregnancies and gave birth to 12 children, six girls and six boys. She and her younger sister made the Oklahoma Land Run together in a wagon and dug a well thirty feet for water. She raised all 12 in a sod house and made moccasins for her 12 children to wear in the winter. They called her Maw and their father, Paw. All 12 lived long lives, but only the boys had large families. Your great-grandmother had an interesting life. I spent a great deal of time with all but a couple of her children, and they all really loved her. Thank you Cheryl for your comment. You called that right Nelda. She was told about a man that had gotten land near her that was sick. She took care of him and nursed him back to health, so he married her. He probably would have died out there alone. Brooks-14227My mother’s father’s father. George Frederick Brooks. One of 9 children, who went on to have 7 of his own. I don't know a whole lot about him and his wife, Mary (as most of what my mother used to tell me was bout his son, also Joseph), other than they came from northern England to the Victorian goldfields; he was a miner, not a panner, they had scads of children .. in the goldfields .. several of whom died (one, I think, in a cave-in or collapse in Queensland). So why is he my choice for "12"? Because he died on the 12th of the 12th 1912. Very cool person for "12". Reminds me - my maternal grandfather was born precisely at midnight, 31 December 1910. The doctor asked his parents, do you want 12/13/10 or 1/1/11? They took the latter. And everyone always remembered his birthday. All those twelves in his numbers makes me wonder! Great answer for 12 Melanie. My birthday is Oct 10, and I was in Las Vegas on my birthday in 2010. There were weddings everywhere, so people could say they got married on 10-10-2010. Bet that 12-12-2012 was a really popular for weddings. #12 is https://www.wikitree.com/wiki/Powney-43, my gr. grandfather and my mother's paternal grandfather, whom she never met. He was born in Staffordshire, England and he and his brother, Edwin bought their young families to Ravenswood, Australia in 1887. Coincidentally, Elon and Annie, his wife, went on to have 12 children. It is too bad that your mother never met her great grandfather. My husband also comes from a family of 12 children. Hi Cheryl, Thanks. You made me notice my boo boo. Elon was my gr. grandfather. My mother's grandfather. #12 Charles G Hamel Is my mother's father's father. Don't know anything about him except he is my mom's grandfather. Heard lots of stories about him. Heard he was from Sweden. Heard he was born on a boat coming over from Germany. Census records have him from New York and Ohio. Heard he left home one day and never returned. He supposedly died in Ohio around 1887 or 88. Ggrandma Amanda was a widow in 1888. Dallace, it sounds like you have a little bit of history on Charles. That is enough for you to get started on a search. Thanks for searching. My number 12 ancestor is my great-grandfather, Alfred Francis Hamel. He was born in Suncook, New Hampshire to Eugene Hamel and Celanise Lefebvre in 1896. He married Clara Laplante in July of 1916 and had many children including my grandfather, Robert. That's only the beginning of the story! My mother tells me that he was known as "Mr. Fix-it" in Newburyport, Massachusetts because he had his own repair shop in the downtown area. I'm thinking he worked on appliances or some of the first refrigerators. He also had a ton of keys as he made them for a living. My mother told me that it was like that show "Pickers" and that the shop was like a Picker's dream. The sad thing is my grandfather never really talked about his father much. Alfred and Clara filed for divorce some time after my great-aunt Doris was born. I'm not sure what the issues were. But, I can tell there were quite a bit. I've never seen a picture of him like I have for my other great-grandparents. My aunts and uncles think my grandfather had pictures. That would make sense as he took a TON of pictures in his lifetime. My aunt recently got a box full of pictures my grandfather had in storage. She has yet to go through them all. She thinks a picture of Alfred might be in there. I should also note that Alfred served honorably in the Navy. There's a history of Hamels serving in the military. My grandfather was one of the first people in the Air Corps after all. His son, Alfred Francis Hamel Jr is actually buried in Arlington National Cemetery. Alfred also had a house on Plum Island, Mass. It's not that far from Newburyport. How do I describe Plum Island? Beach houses. Lots of beach houses! He enjoyed fishing and fixing things. Alfred came from a long line of Hamels which date all the way back to the original 200 settlers of Quebec. We descend from this settler, Charles Hamel. I hope we get a picture of him some day! Just need to dig through my grandfather's stuff! Or maybe my aunts and uncles have a picture. Time will tell! That was some story, CHris, and I hope you eventually find a picture of him. Thanks, Cheryl! I hope I do, too. If I know my grandfather, he had it locked away somewhere. It's probably in a box in a closet. Thank you for sharing the story of Marvin with us. During the Spanish Flu pandemic in 1918, my mother's father's father was sent to minister to the sick and dying in the lumber camps of New Brunswick. He wasn't given any medicine, only a supply of brandy to ease the suffering. He was a Baptist minister who worked tirelessly on the temperance movement, and he didn't open a single bottle of brandy. He was proud to bring back every drop back to Saint John with him. Then he faced a bit of a conundrum, because the authorities didn't want it back. He still couldn't bring himself to give it away and he didn't want to waste it, so it went into storage. He wasn't a rich man and ironically, the only thing his son inherited was the flu brandy. That is a funny story, Laurie. Thank you for sharing. I've been meaning to get a biography done on him to add to his profile. He had 4 children and unfortunately he died when they were all young. His teenage son's ended up having to run the family farm to keep everything going. Nice to meet another Chapin family cousin. Russell Chapin is my 8th cousin once removed. We both descend from Samuel Chapin. There are so many sad stories this week, as the story 12 continues. #12 Vernon Lyle Delos Peasley (10 Dec 1879 - 15 Sep 1966) married Mary Etta Ames (18 Aug 1880 - 19 May 1925) on 18 Aug 1901 and is the father of 4 children and the grandfather of 11 grandchildren. Moved from Wisconsin to Washington before 1900. Don't know a lot about him as his son (my grandfather) didn't have anything to do with him as he was supposedly an abusive father. And my mother didn't have much to do with her father as he was also abusive. My mother had nine children and is a wonderful mother though, so something beautiful came from them. Another sad story. I am sorry to hear this about your mother. Sounds like her life ended up nice though. Twelve is my lucky number, so I had to reply to this week's question. Currently I'm working on the Hoerauf famiily, and so I'm choosing Hoerauf-12 (George), in part because he has a very interesting (and heartbreaking )story. He is not a lucky relative. He's my great-grandmother's brother, and came to the U.S. in the 1880's. His dad had some money and set the sons up with farms, also the homestead act was in force then for North Dakota, so they gained some land that way. George married Bertha and had three kids. Then he and his parents took a trip back to Germany on steamship, apparently to visit and pick up a nanny for his kids. He left his wife and 3 kids on the farm, along with a farmhand. When he gets back, months later, only the farmhand was there - his wife had taken off to NY with the kids! He ends up marrying the would-be nanny, Emma, and they have two kids. One of the kids is born prematurely (3 pounds!) on a trip to the World's Fair in Los Angeles, but survives, which is probably pretty remarkable for the time. Emma later has a nervous breakdown or something and is committed to the state hospital. Six months later, the doctors re-examine her and declare she is fit to be released. Unfortunately, right at this time her husband (George) dies in a car accident. It is not known if relatives knew of Emma's improvement or not, but she is left in the hospital (you needed someone to come pick you up, apparently). Of course, mental illness at that time held a significant stigma. She lives in the mental hospital for twelve more years before dying there. What she learned of her family we don't know. Without a father or available mother, the two children are taken in by an aunt and uncle, who apparently treat them well. I counted through my tree: I have 12 second cousins on my Serbian grandma's side. Some of them are already dead, some I don't even know (but I know they exist), but they are twelve. Jelena, that is a different use of 12. My Number 12 would be James Newton Wiley. While I have a good amount of information on his later life and family, I do not have much on his childhood or parents. I have some names and rough dates, but little to tie them solidly to any one family. James & his wife were the first ones in the family to take up residence in Cape Girardeau, Missouri - the direct family is still in that area to this day, more than 100 years later. Patricia, how interesting that your family were the first residents of Cape Girardeau, Mo. Just think, the town might have been named Wiley instead. I think I worded this poorly. Rather than the first residents of Cape G, that particular couple was the first in the family to establish residency there. The town was established right around the turn of the 19th century, about 100 years before the family moved there. I still think it's interesting when a family in the United States or Canada stays put for more than one or two generations. Patricia, that is alright. No problem. I understand. My husband's family was the 9th settler in our hometown - Momence, Illinois. That was in 1839. Today there are still several Hess families here and many, many people related to them. I know the pride that you have when you have a direct family still in the area. My 5th great grandfather, John Umphlet served in the War of 1812. Baptized on the 12th of december 1762 was Meghel Arts (Arts-60). She married the local smith at about 32 and had 4 children. She died at the age of 56 and that's all I know about her. She is my 4 times greatgrandmother. How sad that she died so young. This one came to me in a second. President https://www.wikitree.com/wiki/Lincoln-103 and my husband https://www.wikitree.com/wiki/Halpin-348 both share the same birthday. That is an interesting fact. Thanks for sharing. Taliaferro Witcher, who was my mother's father's father, was a confederate soldier. He served with Company G of the 42nd Georgia Cavalry as well as Company C of the 1st Georgia Cavalry. By 1870 he was already living in Fremont County, Colorado. He came to Colorado in 1867 from Cave Springs, Georgia. He traveled with a freighter drawn by ox teams as far as Pueblo, CO. From there he walked to his brother's ranch at the mouth of Phantom Canyon near Canon City, Fremont County, Colorado. There he lived with his brother until 1872. He then made a trip to Texas and returned with a trail herd of 5,000 cattle. He made two more trips to Texas after cattle, bringing 3,000 the second time and a herd of 4,000 the third trip, which he made in 1879. This last herd he brought and ranged in the upper country north of Cotopaxi, Fremont County, CO. The first herds were grazed from Cripple Creek to Salida. In 1879 T. Witcher was married to Mary Belle Hardin and they settled in Cotopaxi. Two children were born to them, T. Lee and Otis. Robin, that is a lot of cattle. Was that a record? Cheryl, you know I don't know. It does sound like a lot of cattle! But the Witcher's had a very large ranch on which my grandfather worked and my mother lived for a short while. But they never became Cattle Barons -- at least not the kind that got rich! Robin, at least not rich enough to leave you any money. My sister just got her certificate for this line- we will be in Plymouth soon to celebrate the 400th anniversary of the arrival of our ancestors! That is very cool, L. Ray Sears. I was looking at my family tree. I think my may go back 11. But not 12. Congratulations.